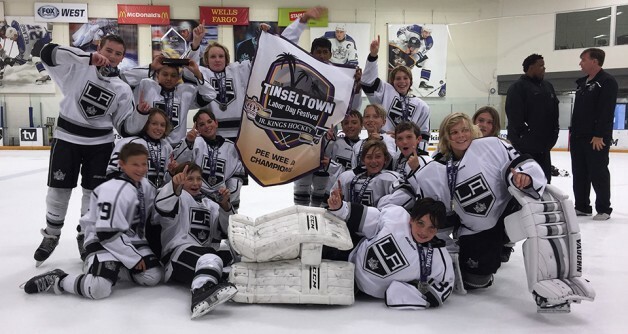 A record-high 31 teams from Northern and Southern California and Nevada competed in this year’s Los Angeles Jr. Kings-hosted Labor Day Weekend Festival Tournament, which was showcased from Sept. 4-7 at Toyota Sports Center. Champions were crowned in six divisions: Bantam AA (Jr. Kings 1); Pee Wee A (Jr. Kings 2); Squirt A (Ice Dogs Hockey Club); Squirt BB (Ice Dogs); and Mite Track I (Anaheim Jr. Ducks) and Track II (Jr. Ducks). “We can’t thank all of the participating clubs enough for helping deliver what proved to be an exciting weekend of hockey to kick off the new season,” tournament director Brian McDonough said of the fourth annual event. “There was so much great competition in every division, and the camaraderie and sportsmanship displayed by all of the players, coaches, team managers and families was second to none. Grimaldi’s Pizzeria, Rock & Brews, Simms Restaurants and Kings Cove served as restaurant partners for the event. “Their hospitality throughout the weekend was outstanding,” McDonough added. Tournament vendors included Fine Designs, Origami Owl, AM Sportframes and Grace Of Thunder. The Labor Day Weekend Festival is part of the Jr. Kings’ Tinseltown Tournament Series. Pre-registration is now open for the Series’ remaining three events of the 2015-16 season: the Thanksgiving Extravaganza (Nov. 26-29), Presidents’ Day Challenge (Feb. 12-15, 2016) and Carmen Starr Memorial Day Classic (May 27-30, 2016). For more information and to pre-register for any or all of the events, visit http://www.tinseltownhockeytournaments.com.